We’d love your help. Let us know what’s wrong with this preview of First Steps to Seeing by Emma Kidd. In the twenty-first century we are confronted with a rapidly changing world full of social, economic and environmental uncertainties. We are all inherently connected to this changing world and in order to create the best possible conditions for life to thrive, we must each develop an inner capacity to respond and adapt to life in new, creative and innovative ways. The autho In the twenty-first century we are confronted with a rapidly changing world full of social, economic and environmental uncertainties. We are all inherently connected to this changing world and in order to create the best possible conditions for life to thrive, we must each develop an inner capacity to respond and adapt to life in new, creative and innovative ways. The author of this visionary book argues that the path to a happy, healthy and peaceful world begins with the individual. By learning to recognise our cognitive habits of interrupting and defining life through our fixed ideas, labels and judgements, we can begin to develop a dynamic way of seeing that enables us to perceive and respond to life with greater attentiveness. To ask other readers questions about First Steps to Seeing, please sign up. 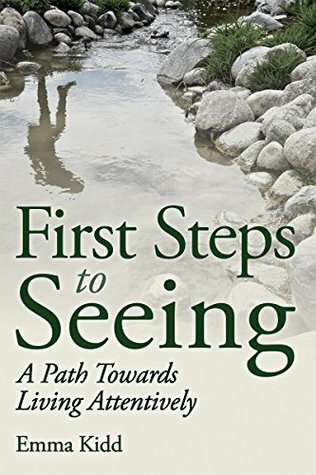 First Steps to Seeing: A Path Towards Living Attentively is Emma Kidd’s first book. Emma Kidd “left the fashion industry to investigate alternative ways of thinking about and doing business” (p. 11). What she didn’t expect was that her explorations would take her right back to the very foundation for her previous work as designer – the “way of seeing” (p. 11). The book has two parts: Developing a Dynamic Way of Seeing, and Giving Life Our Full Attention, and is designed to take the reader on a j First Steps to Seeing: A Path Towards Living Attentively is Emma Kidd’s first book. Emma Kidd “left the fashion industry to investigate alternative ways of thinking about and doing business” (p. 11). What she didn’t expect was that her explorations would take her right back to the very foundation for her previous work as designer – the “way of seeing” (p. 11). The book has two parts: Developing a Dynamic Way of Seeing, and Giving Life Our Full Attention, and is designed to take the reader on a journey “that encourages us to fully notice life by paying acute attention to the ways in which we see, think and act, every day” (p. 14). The book also serves as an introduction and guide to Henri Bortoft’s work. Henri Bortoft called the switch of attention from 'what we see', to 'the way in which we are seeing' a “dynamic way of seeing” (p. 32). A dynamic way of seeing involves “noticing our experience of life as we are experiencing it, rather than analyzing it” (p. 15). It “enables us to transform the way in which we relate to ourselves, to other people, to our work and to life in general” (p. 16), and “ask[s] us to become more gentle, vulnerable, open and intimate in our encounters with the world” (p. 17). Fundamentally, it is “a way of being in, and relating to, life” (p. 109). Living attentively “allows life to thrive, both inside and outside of us” (p. 109). Developing a dynamic way of seeing involves “pausing any internal dialogue that is occurring in our mind and opening our awareness to notice the way in which our senses can perceive the world” (p. 40). By shifting our attention “from our thoughts and towards our senses we can move beyond our habits of perception and begin to rediscover our own experience of life” (p. 41). When we “become aware of the way in which our thoughts divert our attention away from our experience of the world, we can make an effort to redirect our attention and attempt to more fully experience life” (p. 47). Although our “thoughts are an intrinsic … part of our experience, they are often part of a secondary ‘meaning-making’ process that attempts to re-present the life that our sensory experience first presences” (p. 47). The “awareness that exists prior to our thoughts”, in the form of words, “has a clarity and freshness to it that brings our experience of the world directly to the forefront of our perception” (p. 47). “Lived experience is our capacity to experience life, as it is being lived, in the present moment” (p. 51). Henri Bortoft believed that “perception can only truly begin when we slow down” (p. 51). Our minds often work incredibly fast, jumping “from one thought to the next” (p. 51). By slowing down, “changing the way we see, and the way in which we notice the world around us, we are literally changing the way we use our mind” (p. 60). This makes it possible “to experience a new richness, depth, and diversity in the life around us” (p. 63). We can also “use our imagination as a mirror to reflect on our experience and to bring it to life again in our mind” (p. 63). When we “use our imagination to re-member (put back together) a particular experience, as exactly as possible, in all its sensory and felt detail,” we can review the experience “without the distractions of personal opinions, analysis, preconceive ideas or definitions” (p. 64). Since we are all different, “there are no fixed instructions for the exercise of exact sensorial imagination” (p. 65). “We just need to pay full attention to our sensory experience of life and then try to accurately bring that experience back to life in our imagination” (p. 65). When we let “our intellectual analysis dominate our investigations, our living experience of the world tends to be overlooked” (p. 73). “This leaves us blind to the life of the world around us” (p. 73). The action of “fully focusing on our experience, rather than our thoughts, has the effect of … connecting us directly to the world” (p. 82). We can then “release the specific focus of our attention and open our awareness, so that we remain present to our experience yet not fixated on it” (p. 82). This “frees up our intuition to sense life in its own unique way” (p. 82). Intuition is also “called non-inferential perception” (p. 81). With “focused sensory perception” we narrow our gaze, whereas with “intuitive perception” we loose gaze and open our attention (p. 84). Putting “intuitive perception” into practice is not as straightforward as the “ways by which we can put our thoughts and senses into immediate action” (p. 84). Again, there are no fixed instructions “that will guarantee successful results” (p. 85). “All we can do is try to create conditions within ourselves for intuitive understanding to emerge” (p. 85). The validity of our intuition can be strengthened by “most crucially coming to know ourselves, ever further and deeper” (p. 86). Wholeness is “intrinsically embedded in all parts of nature” and “expresses itself through the parts that make up whole forms” (p. 87). Henri Bortoft distinguished between 'authentic' and 'counterfeit' wholes. An ‘authentic’ whole ”reflects the type of wholes that nature creates, where the whole is always present in the parts” (p. 90). This type of whole “cannot be reduced by simply removing ‘parts’ of it” (p. 90). The authentic whole “is created by an ongoing, interactive ‘dialogue’ between the parts and the whole(s) of which they are a part” (p. 92). “An authentic whole is … a coherent integrity which becomes expressed through the parts that make up its form” (p. 92). The parts rely on “the coherent integrity of the whole to guide their development, but they are not slaves to the whole” (p. 92). The parts are “a place for ‘presencing’ of the whole” (p. 92). “In an authentic whole there is an intrinsic relationship between the parts and the whole but neither the part nor the whole is dominant; they are not separate entities and cannot be separated” (p. 93). A ‘counterfeit’ whole, on the other hand, is “a kind of ‘super part’ which domiciliates the parts that it creates by sitting over and above them, assuming significance, supremacy, and superiority” (pp. 91—92). This type of whole consists of “a collection of separate parts that have been assembled … in order to create the ‘whole’” (p. 92). Counterfeit wholes “operates as separate entities” (p. 92). They have “just been put together” (p. 92). “Our ability … to distinguish between authentic and counterfeit wholes … can help us to recognize what is genuine, and most satisfying, in our everyday lives” (p. 93). “In nature, in order for a whole to thrive, its parts must thrive also” (p. 95). “The same goes for societies, neither the part nor the whole can dominate, they need to authentically work together” (p. 95). Paying full attention “to noticing what brings us alive and intentionally expressing that vitality draws out the same potential in others also” (p. 124). If we want “to create livelier … societies we each need to find our own ways to come more alive and to be more fully human” (p. 124). “Paying attention to experiencing ourselves and presencing our own life … enables us to become more present, vulnerable and authentic” (p. 125). This creates “new space for life to flourish and flow within us” (p. 125). “A living inquiry is a dynamic way of seeing in action” (p. 130). Emma Kidd cites several authors and researchers in the book to “demonstrate a form of living inquiry that allows the part of life being studied to become its own theory and to show itself, on its own terms” (p. 130). The case studies are very interesting and “illustrate the way in which systemic change can begin with an individual” (p. 143). “By using living knowledge to put the needs of life itself at the very centre of professional practice,” each case study shows “ways in which life can, and does, thrive” (p. 143). The projects and people in the book provide examples “of a truly revolutionary way of working” (p. 143), but to truly change the way of being at work is difficult. Emma Kidd has “come across many businesses and individuals all over the world who are really trying to make a difference but many only manage it in a partial way” (p. 168). They might, for example, “still end up controlling their employees rather than finding ways that allow them to genuinely thrive” (p. 168). Emma Kidd noticed, on reflection, “that these contrasting ways of working form two very different approaches to life and to business – one in which life generally suffers and in the other life quite obviously thrives” (p. 170). The case studies in the book display “a radical form of honesty and openness” (p. 174). They provide “a kind of … open-source project design and development, offering … a starting point from which to provide the best possible conditions for life to thrive in our own communities, schools, offices and businesses” (p. 174). The projects are very important “examples of the way in which parts of life can thrive when whole systems intentionally give their parts the freedom to do so” (p. 174). “At the root of everything we create is the mind that created it, including the organisations in which we work and the societies in which we live” (p. 176). A dynamic way of seeing “shines a light on the conditions within which life is most likely to flourish and therefore makes it possible for us to replicate these conditions” (p. 176). This is why a dynamic way of seeing and being is so important! A lovely book for reminding you to pay attention to the detail of life as it happens.